The Singapore residential real estate market trend Q3 2018 showed resilience despite the introduction of new cooling property measures in July this year. Reports indicate that the residential collective sales in Q3 2018 plummeted due to fresh measures. However, experts believe that the volumes will pick up by the mid of next year. On July 6 this year, the Singaporean government increased the rates of the Additional Buyer’s Stamp Duty (ABSD). Simultaneously, the authorities also tightened the limits for the Loan-To-Value (LTV) for the purchasers of residential property. But the launch of a few new projects stirred a healthy buying interest among the buyers despite the introduction of these cooling measures. Interestingly, the demand for private homes continued to float in some market segments. The Urban Redevelopment Authority (URA) data revealed that the number of private homes minus the executive condominiums sold in Q3 2018 increased by 27.3% whereas the new home sales both uncompleted and completed in the Rest of Central Region (RCR) rose by 90.8%. The surge in the sale of new residential properties can be due to the launch of multiple projects in the RCR. The real estate trend 2018 reveals that property dealers sold more than 1,000 new homes a night before the implementation of the new measures with the investors rushing to put a seal on the deal. The haste was to ensure that the new residential property buyers could buy their homes on old conditions before the new ABSD declared rates kicked in. 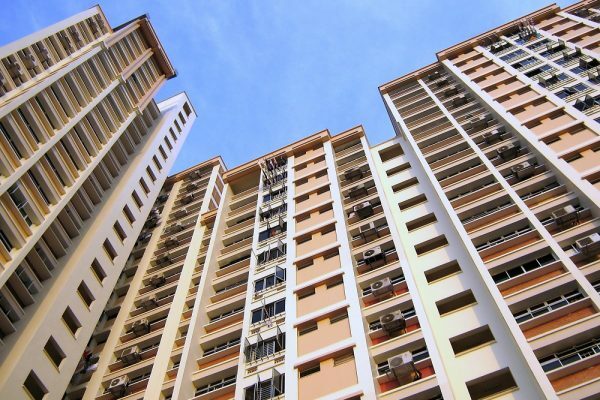 The resale market in Singapore in Q3 2018 faced the greatest brunt due to the new cooling measures with the sales falling by 43.1%, which is around 2,672 units. On the contrary, the residential home prices did rise even though a bit slow at the rate of 0.5% in the third quarter of 2018. The overall residential real estate market in Singapore prices rose by 7.9%. The government authorities did not disturb the interest for luxury homes as the property sold in this real estate segment continued to be higher for more than four years. Despite the cooling measures, the real estate market showed the sale of six super luxury homes having around $10 million price tags. One of the reasons for it could be because many foreigners believe that the purchases are cheaper in comparison to countries like Hong Kong. Christine Sun, the Head of Research & Consultancy at OrangeTee & Tie Pte Ltd stated, “The steady demand for luxury homes above S$3 million suggests that Singapore remains a top investment destination among high net worth individuals and affluent foreigners.” This statement aptly reveals the current real estate Q3 2018 trend. The Q3 2018 experienced a lot of market disruptions, especially with the launch of cooling measures resulting in the increase in pace of price for the entire private residential market to slow down to 0.5 % after it rose to 3.9 % and 3.4 % in Q1 and Q2 respectively. The private property prices continued their upward trend (1.3%) whereas it fell in the Outside Central Region (0.1 %) as well as the Rest of Central Region (1.3 %). The developers continued to press ahead with their launches going along with the past trends which showed that the sentiments of buyers recover in around three months after every round of cooling measure. Chances are that some of the developers will pace their sales momentum and par down their inventories gradually for avoiding paying of penalties for unsold units after five years. The cooling measures started showing its effect in the third quarter on the pace of growth of the prices in terms of private residential properties. Mostly the prices continued to rise because of the buying supported by first time buyers of homes as well as by the investors who were looking for real estate market investment as a part of the diversification process. Experts believe that one of the reasons the sales in the residential real estate market in Singapore dipped in 2018 because the buyers had subdued sentiments. Most of the buyers took the wait and watch approach. Also, the sales slowed down because of “The Chinese Ghost Month” in August. Another after-effect of the cooling measures was that the buyers started showing price-sensitive approach. For example, Riverfront Residences fetched below $10 million prices in real estate Q3 2018 trend. The recent signs indicate that the prices will slowly become stable. Experts predicted very few completions in 2019 and hence expect the property rents to appreciate next year. But all these predictions will come true only if the global economy continues to remain robust. The cooling measures however did not show much impact on the prices of non-landed homes in CCR that continued to remain stable as the price index rose in the fifth consecutive quarter. Individual resellers asked for higher prices because of less number of completed homes whereas some of the buyers, especially those belonging to high net worth individuals were also ready to pay higher Additional Buyers’ Stamp Duty. They did so because of their belief that the new luxury home prices will increase further as more units in this category are launching soon from the enbloc sales sites. Collectively, Singapore’s investment sales reached SGD 31.4 billion in the first three quarters of this year leading to YOY of 14%. The research says that 2018 investment sales in Singapore will most probably match the SGD40 billion record values of 2017. The quarter-on-quarter (QOQ) residential investment sales in the third quarter this year slumped by 57.9% hitting the bottom-most of SGD3.46 billion, the lowest in volume since the first quarter of last year. The sale of government land made up for the bulk of 47% investment sales of residential projects in Q3 2018. The five companies to receive public residential land tenders in Q3 include Jalan Jurong Kechil, Hillview Rise, Canberra Link (Executive Condo), Dairy Farm Road, and Anchorvale Crescent (EC). The segment of Good Class Bungalow (GCB) posted a robust growth of sales soaring by 188% YOY and 109% QoQ to SGD354 million in the third quarter this year. Records indicate that this is the highest sales volume achieved by the Singapore’s residential property segment since Q2 2012 with the sale of SGD364 million of value. Overall, even though the residential real estate trend 2018 is not supportive of the real estate developers, brokers as well as for the buyers, it still offers a lot of hope for the future. Market experts believe that by the end of next year things will brighten up largely for residential property investors and sellers as project developers at large will adopt finally with the new cooling measures. The demand at present has a good support from the strong economic fundamentals and hence there are many buyers who can afford private homes and are ready to buy but are waiting for the right opportunity to make a move. With prices now becoming stable, many believe that it is the best time to catch a good buy before the prices rise again.